Join us for the first Inspire of 2019! 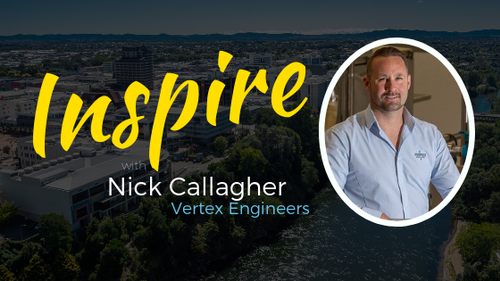 This time, we will be having a chat with Nick Callagher from Vertex Engineers. Nick is a visionary leader with a wide range of engineering disciplines. Nick started Vertex in 2011 with a vision in mind ‘design innovation + engineering excellence’. With a solid reputation in the delivery of Materials Handling, Packaging and Process Engineering projects, Vertex has become one of the fastest growing innovative Dairy and Consumer Foods engineering companies in New Zealand. This foundation has attracted some of the best engineers in Australasia and gives clients confidence and assurance that their projects are a success. Nick continues to work with his team personally to provide visionary leadership, engineering support and is key when it comes to client relationships as he has a passion for people.